Excellent all-around connectivity is the norm with even mid-range smartphones these days so Nokia N9 would have no excuses if it failed to provide in this department. Fortunately, this is not the case as the MeeGo flagship offers a really great set of radios and ports to fit all your needs. For starters, all kinds of network connectivity options are at your disposal - GPRS, EDGE and 3G with HSPA (14.4 Mbps HSDPA and 5.7 Mbps HSUPA). The GSM/EDGE networking comes in quad-band flavor and the 3G covers all the five bands available worldwide – 850/900/1700/1900/2100 MHz. The USB is version 2.0, with the standard microUSB port capable of charging the phones besides transferring data. Bluetooth connectivity is version 3.0 and naturally there’s A2DP stereo Bluetooth support, while the dual-band Wi-Fi antenna has support for the a/b/g/n standards. The Wi-Fi hotspot functionality is a nice way of sharing your N9 data connection with your laptop. Finally, there's the NFC, which can be used for speeding data connections as well. When you choose to share something over NFC, the connection is actually carried out over Bluetooth, but the NFC radio is used for the initializing the connection, instead of going through the pain of all the searching, PINs etc. Check out how that works on the following video. NFC can also be used for connecting your N9 to various accessories - Bluetooth handsets, speakers etc. You just tap the handset against them et voila - the sound starts coming out at the other end. The web browser is a crucial part of the every modern smartphone platform and we are pleased to say that Nokia got things right with the N9. Unless you need Flash, that is, as there's no support for that. When you launch the N9 browser you are given an automatically generated list of your top sites. Nicely looking, that list makes sure that your most frequently visited websites are always just a few clicks away. If that's not enough for you, just hit the address bar and start typing. The search suggestions work extremely well, looking up the string you typed in the URL and the title of the pages you have visited. You don't need another field for initiating a Google search, either. The shortcut for that appears right below the address field. The browser UI remains minimalistic for the whole trip. All you get is a reload/stop button next to the address bar and a More options button next to it. Hitting that More options button lets you open a new window, share the currently open page (over SMS, email or any of the social networks, where you have registered account), add it to apps or subscribe to it RSS feed (if available). 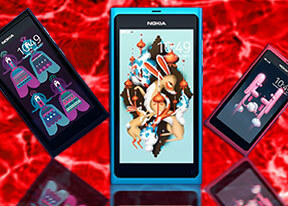 The Nokia N9 takes a really extraordinary approach to handling multiple windows. Each of them gets its own card in the multi-tasking screen and is basically behaving as a standalone app. If choose to add a page to apps, you get to choose a name for it, while its icon is generated automatically by the handset. After that you get a shortcut to the site in your app drawer. Clicking on an image lets you save the image to your gallery open it in a new window or just share it. The Nokia N9 renders pages nicely and is smooth in panning around them and zomming. Sadly there's no text reflow so you might run into trouble finding the right zoom for your reads now and then. The N9 really has one of the best designed browsers even if lacks some functionality - find on page, text reflow and Flash support being the most problematic of those. What it lacks in skills though it makes up with performance - you would hardly feel that it's a two-year old single-core CPU inside the N9 when browsing the web.